Question for readers – what do you think of the new order of the sidebar? Question for folks reading this weblog: what do you think of the way I just re-ordered the sidebar of this blog? The “Recent Posts” section was up at the top before and while that was useful, I thought it might be more helpful to have the list of categories and contributors up near the top on the first screen of information people see. What do you think? Did you use the “Recent Posts” to quickly see what was here? Or did you just scan down the page? (or read this site in an RSS reader?) Any comments or opinions would be appreciated. I can re-order it in whatever fashion we wish. This entry was posted in Voice of VOIPSA Info, VOIPSA on March 30, 2007 by Dan York. As noted earlier, there was an “RTPSEC BOF” session at the IETF 68 meeting last week in Prague. Minutes of the RTPSEC meeting have now been posted, which give a sense of how the discussion went. I’ll provide my own commentary in a separate post (and probably this week’s Blue Box podcast)… for now, I’ll point you to the minutes. Please note, too, that we welcome guest bloggers here, so if someone who was there is interested in providing their own view on the meeting, drop me a note. 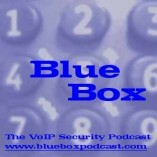 We’re always glad to provide a forum for folks to post about VoIP security. This entry was posted in Standards, VoIP Security on March 26, 2007 by Dan York. Special thanks to VOIPSA members Shawn Merdinger and Dustin Trammell who created the list and have graciously agreed to maintain it. For more information about the tools list, you can listen to Dan York and Jonathan Zar discuss it in Blue Box Podcast #54 and also with Shawn Merdinger in Blue Box Special Edition #16 available at http://www.blueboxpodcast.com. This entry was posted in VoIP Security, VoIP Security Tools on March 14, 2007 by David Endler. Next week – perhaps the most important IETF meeting about VoIP security in a long time – how will we do SRTP key exchange? Next week in Prague, at the 68th IETF meeting, there will be a great many meetings of importance to people concerned about VoIP security, but perhaps none more important than the RTPSEC BOF about SRTP key exchange on Monday, March 19th. As readers and listeners know, one of the key missing standards right now is how vendors can exchange encryption keys for SRTP. It sounds (and is) geeky, but here’s the impact to the market. Right now, if you buy an IP-PBX system and IP phones from Vendor A, but you want t also buy some SIP phones from Vendor B, there is currently no agreed-upon way for Vendor A and Vendor B’s phones to send secure voice from one phone to the other. Within Vendor A’s IP-PBX and phones, SRTP can be used – and if you were to buy a full system from Vendor B, SRTP could be used entirely there… but there is no agreed-upon way to let Vendor B’s phones work with Vendor A’s phones for SRTP. Back at IETF 66 in July 2006 there were 11 or 13 proposals (which we covered in Blue Box Podcast #22) but the fields been narrowed now to basically three: DTLS, ZRTP (Phil Zimmermann’s proposal) and a new version of MIKEY. Dan Wing is leading another face-to-face session next week in Prague where the intent is to try to narrow this even further and see if we can’t all agree on a common standard for how to do SRTP key exchange. IF YOU HAVE COMMENTS OR OPINIONS, NOW is the time to make them! If you can’t get to Prague, you can still join the RTPSEC mailing list or read the Internet Drafts and send comments in to the authors. Please read the drafts and do provide comments… if we are to see secure voice interoperability between SIP phones, this meeting and the discussion therein is extremely important. Please make your opinion heard. This entry was posted in Standards, VoIP Security on March 14, 2007 by Dan York. This brings up memories of the Edwin Pena case, in which he was able to rake in over $1 million USD in profits from stealing and reselling VoIP minutes from several providers. Does anyone know for sure how these VoIP provider gateways are being broken into? Default passwords? Well known vulnerabilities in the operating system? Stolen access codes? This entry was posted in VoIP Attacks in the News, VoIP Security on March 12, 2007 by David Endler. For some background, there was a compelling presentation at last year’s BlackHat security conference by Jay Schulman, entitled Phishing with Asterisk (PDF). In his presentation, Jay showed how easy it was for attackers to use Asterisk PBX to set up a spoofed banking automated attendant and route all calls to a toll free number through to that PBX. Additionally, Mark Collier and I devoted an entire chapter to VoIP Phishing in our book, Hacking Exposed: VoIP. 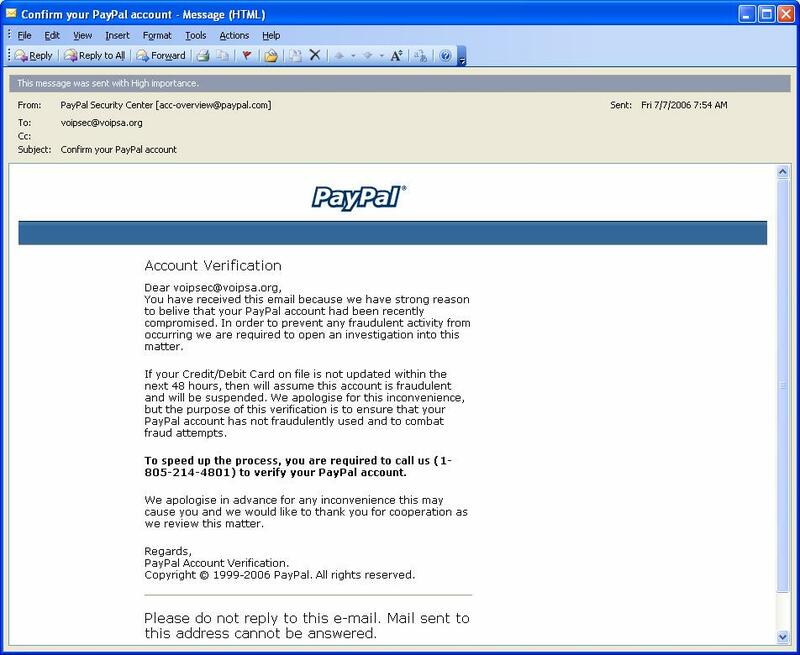 I’ve included a snapshot below of one of the first VoIP Phishing emails targeting PayPal that emerged last year that we showcased in our book. Click on it to see the larger image. This entry was posted in VoIP Attacks in the News, VoIP Security on March 8, 2007 by David Endler. As part of the alliance, the integrated fingerprint reader in Lenovoâ€™s ThinkPads and Password Manager technologies will support Avayaâ€™s IP Softphone solution. This will bar unauthorized people from using a Softphone or accessing their phonebook if the laptop is lost. We’ve written and talked in the past about the use of biometric devices to control access, but unless I’m wrong this is one of the first times I’ve heard it mentioned specifically with a VoIP product from one of the major VoIP vendors. Cool to see. 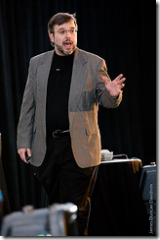 This entry was posted in Biometrics, VoIP Security on March 7, 2007 by Dan York.